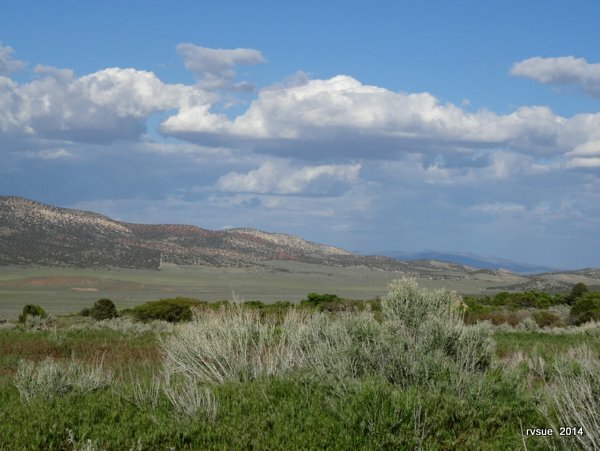 Photos in this post are scenes around our camp near Salina, Utah. The familiar white pick-up goes past our campsite on the other side of the fence. There goes Del, checkin’ the chickens. I’m at my laptop looking out the back window when I see him go by. Suddenly circuits fire in my brain. Yes, that’s what I’ll do! I’ll ask him. He’s a local. He’ll know. I watch until the pick-up turns around and heads back this way. Then I dash outside and stand at the fence as if waiting for a bus. Del stops the truck and says, “Hi!” His son, Reg, is with him. Reg works at the correctional center in Gunnison. “How are the chickens,” I ask. “Oh, I’m sorry. Do you still think it’s a coyote? We chat for a while. Del has driven about a hundred miles over the past few days, going to cemeteries to place flags on the graves of veterans for Memorial Day. He and Reg finished the flags today. The two of them are going up to Fish Lake with the grandsons this weekend to do some night-fishing for splake. I ask the question that’s been on my mind. Del and Reg invite me over to see the cabin they built. Quickly I put Bridget and Spike inside the Best Little Trailer, shutting the door with a promise to return. Reg walks up the lane to the cabin while Del drives around and picks me up. The first structure we come to is an outhouse in a small clearing. Of course it has a crescent moon cut into the door. We pull up to the cabin. “Oh, look at that! I love it!” I exclaim as I climb out of the truck. I touch the bark on the rough, porch columns. “You can come back and take pictures,” Del suggests mildly. Reg comes out the cabin door and reports that a stink bug got inside. Del explains the construction they used is called cordwood. Del and Reg obtained a permit to cut the logs. Each log is sixteen inches long. The exterior and interior walls are four inches thick of cement, leaving an eight-inch air space between. It’s a snug cabin. Gee, I’d love to see inside, but it’d be too forward to ask. Del reads my mind and opens the door. The dimensions of the cabin are about 13 ft. by 20 ft. Directly inside the door is a round table with a red checkered tablecloth and four curved, rustic benches. “I made those,” Del points out proudly. To the left is a kitchen counter, sink and appliances under the window. In the back left corner sits a black wood stove. In between, against the left wall, is a dresser. A bunk bed covered with a Mexican blanket is against the right wall. A shelf runs around the room at the eaves. Everything is simple in design and functional with no excess space. The log ends that polka-dot the walls, the plank flooring, the exposed beams of the ceiling, and the bright colors of the tablecloth and blanket make a very cozy abode. We go outside and walk around the side of the cabin. I joke around with Del and Reg, acting as if this is my cabin. I show them where the roses will go. The view from the porch is the turkey feeder hanging in a tree. The creek is nearby. Oh boy, if ever I want a home again, I’d want a one-room cabin like this. And what an idyllic setting. On the short ride back to the campsite, I ask Del another question. I don’t know what prompts me to ask it. “Really!” I respond, surprised at this revelation. Sitting in the truck together, I listen while Del tells me a little of his family history. I respect these two men, father and son, who build together, who check chickens and night-fish and place flags on graves together, and who, without hesitation and in good spirit, befriend a temporary neighb0r. 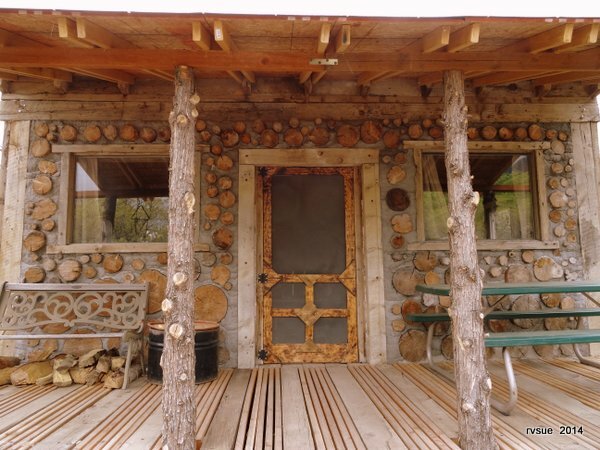 This entry was posted in Simple living and tagged camping, cordwood construction, Ivie Creek, Mormons, Salina, Utah. Bookmark the permalink. You meet the most amazing people, Sue. It seems like you attract them to you. Fascinating story about Del & his family; fascinating cabin he & his son built. Thanks for being an unfailing source of information & entertainment. As Paul Harvey would say “and now, for the rest of the story.” You seem able to find the “rest of the story” wherever you go. You’re welcome, Renee. It’s been fun meeting Del and Reg and learning about their lives and this beautiful valley. The rancher of the cattle drive post is Del’s brother-in-law! I told Del and Reg about the blog and hope they see how my readers enjoyed getting a glimpse of their way of life and the respect expressed for their family. Wow Sue, absolutely fascinating! Learned about a new style of construction & two very nice people (besides you)! Sure wish you could get some inside pictures of the cabin..suppose they lock it. Anyway appreciate all your pictures of this adventure..must show them to my carpenter better half…..one step closer to RVing, sold our little 17′ Prowler trailer today, after putting it on Craigslist at 11 am!! Wow, we could have sold a bunch of them, so many people contacted us..the first lookers bought it…we want to move up to a 25’…okay, enough of my story..Thanks again!! Congratulations on the quick sale of the Prowler! Little trailers go fast. I gave up on buying used once I saw that. Have fun shopping for a roomier home. I’m glad you found this post fascinating. I was fascinated, too, by a lot that went into it. That’s awesome. I’ve never heard of that kind of construction. Thank you for, once again, introducing me to something new. 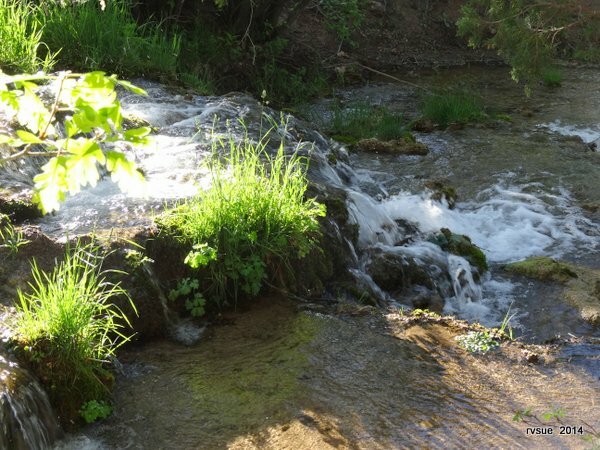 I’m also loving the peaceful pictures of the stream and waterfalls. It must not be very hard to relax in that location. Just awesome! Cordwood construction is new to me, too. It puts a lot of character into the cabin, as well as creating a snug structure. Folks, as we remember the ones who gave their lives that we might be free, take an extra minute or two and say a prayer or prayers for the ones they left behind. There are many moms, dads, wives, husbands, sweethearts and kids for whom memorial day is a reminder of a very personal loss. Then continue and pray for those still serving our country today. Unfortunately, we know that next year there will be still more to be remembered. And finally, pray for the men and women who come home injured and the long road many of them have to some sort of recovery. These folks pay for our freedom, we owe them our respect and prayers. And if you see someone in uniform – tell them thank you. Very well said. Thank you, Reine, for the important reminder. Hmm an eight inch space in between…for insulation? Does it have electricity or run on solar? I see a box fan in the window. The pattern of log work is neat! Very interesting lineage….Grove Creek it is! Oh, I could take that man cave and make it my own! What fun that would be! And between putting an enamel pot of flowers on the table and other touches, I’d sit on the porch and watch the turkeys. The cabin is a work-in-progress. They aren’t sinking a lot of money into it. At this point there are two, small lights inside that run off batteries (I assume they use a generator). There isn’t electricity run up this way and they don’t have solar. That air pocket between the walls moderates the temperature inside. I’ve always been drawn to small houses, whether a seaside cottage or a cabin in the woods. I don’t understand why wealthy people purchase these huge homes to rattle around in. This is a man cave. The shower is the creek or a pail of water heated on the woodstove! Remember… showers as we know them are a relatively recent invention. The Ivies are a longtime, local family. Ivies = McCoys or Hatfields! Is there no peace anywhere except where you are? Glad you ran into some good Mormons…and there are good ones…my folks lived next to the other kind, ahem…one could write a book. But bad people hide in all sorts of places. Probably many stories not yet written down as Del told you about… Very nice of them to show you their cabin…have seen some others online built like that. Hope the rest of your time there will be equally enjoyable!! Thank you, Elizabeth. I expect to enjoy living here as long as we stay. Yes, it was very hospitable of Del and Reg to give me a tour of their cabin, inside and out. They have a right to be proud of what they’ve created. I found that a rather odd comment from Elizabeth… as my contacts with Mormons have invariably been good. I would almost say it the other way… I’m sure that there are some bad ones (other than the well-known polygamists extremists), but I personally haven’t encountered any of them. Yes, those of us who don’t share their beliefs get tired of their proselytizing, but even that means well. I encounter many of them in Arizona… and am always impressed at how well behaved their children are!! Let me clarify then…and I would think in part this might depend upon WHERE you live. We used to live in a place that had more of them than any other church denominations. I think when you are in an area that has less, maybe there is less chance ending up as my parents did. Their neighbors were something else. Had it been me, I think I would have gone to the church and asked for help with those people actually. And on the other hand, in the same town, my husband had a Mormon aunt who was the best of the best. I did say that bad people do hide in many places…and that is true of perhaps most any group. There was some years ago (and I have no idea now as to how it is) but that it was ok to have a different standard of behavior with those not in their church. And no, their going door to door to try to get converts does not bother me. That should be ok in a free society. I simply mentioned that running into good ones is a good thing…you would not want to experience the ones my parents did (I would have moved away from that property it was so extreme!!! But my dad liked the location and would not budge). READERS… Let’s leave this topic. I spoke with Del today. He told me he read the above. Much to my relief, he was not offended by it. I love the cabin. With 16 inch walls it should stand forever. Thanks for your reminder of Memorial Day. I’ve been thinking about it for several days. 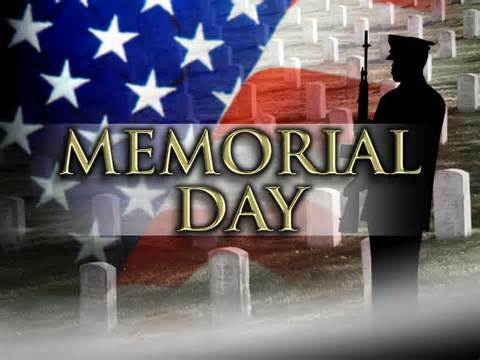 Did you know that Memorial Day was originated by a group of former slaves, in 1865, in Charleston, SC, who had discovered that 257 Union soldiers were buried In a mass grave in a Confederate prison camp. They spent two weeks digging up the bodies and giving them proper burials as thanks for what they had done to free the slaves. Then they held a parade of 10,000 black people, led by 2800 school children where they marched, sang and celebrated. My brother and ex-husband and many of my high school friends served in Vietnam. Now I have friends who served in Afghanistan and Iraq. I do not support these wars, but I totally support the troops. They put it all on the line. And they struggle all their lives to deal with their war experiences. I am really happy to see people show gratitude and support. Every vet deserves our gratitude and respect. I didn’t know the history of Memorial Day. That’s very interesting. What a remarkable thing! I wonder where that mass grave was… Andersonville, GA, perhaps? I went there. What a sad place with a horrible history. The men who died there are among the many we remember today. Thank you for reminding us to remember and honor our veterans and those who love them. My Great Great Grandfather died at Andersonville. He was from Kentucky and was captured at Fort Pillow just north of Memphis. I hope to go to Andersonville someday. Andersonville is a very sad place. It was a sunny, clear day when I went there, yet gloom hung in the air. Your middle name must be Serendipity! Thank you for your wish for the safety of me and the crew. Yes, I want that cabin real bad, too! I’d love to spend every spring and fall here. Enjoy the warmth of that wood stove before going to AZ for the winter. Roll around the West during the summer and then come back to the cabin to watch the maple trees turn red and gold. *sigh* Wouldn’t that be wonderful? I want that cabin real bad three! LOL I have never heard of, nor seen, cordwood construction! I would love a tour of the inside as well! You do meet fascinating people Sue! Thanks for sharing and teaching me something new! And now Sue when you look at men and wonder “What are they thinking” well now you know, feel privileged you got invited into the man cave, lol………….Your sorta like Darla from the (little rascals) (our gang) once in, your a member for life! Im trying to get across two things, respect for those who gave it all for us so we could be not only free but have great teachers that wanted to come here and experience freedom and teach us. Im sure you were a great teacher and if you didn’t know it, your still a teacher, you just took it on the road and now teach a different subject. You get to teach from real experiences and pictures, real life scenarios that happen daily. My post is not only for veterans but for good teachers as well, because if it wasn’t for veterans we wouldn’t have good teachers…………. Looking at the picts of the stream I would be soaking my tootsies too and Spike would just have to learn learn how to share. It’s amazing how good teachers impress us. We remember them all our lives. Thank you for your respect for veterans and teachers. 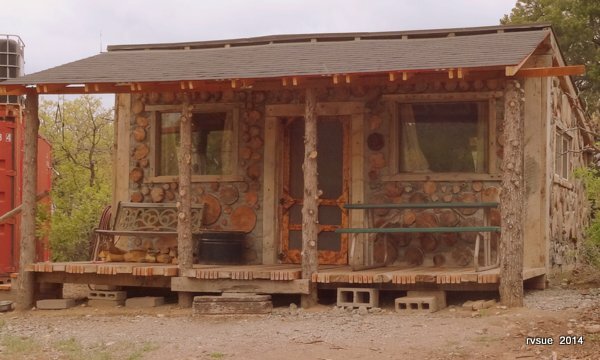 I have never seen a cordwood house before, or maybe I have and never paid attention! If the inside looks like the outside, it sure would make for some interesting decorating. Like another reader, I’m wondering what the heck an Ivie is? I guess what Del said about his great-great-grandad was better understood when heard, rather than read. Scroll down to my sister Pauline’s comment. She explains it very well. Such a lovely story….really brings my holiday into perspective! Thank you, cozygirl. However you spend your Memorial Day, I hope it is good. Interesting reading – feels like Laura Ingalls Wilder’s Little House on the Prairie. Seems like there are still people happy to live in this setting rather than life in the big city. Thanks for sharing your experiences. I think a lot of people would like to live in a cabin in a beautiful, natural setting like this. Hard to make a living out here and you need the 20 acres required before you’re granted a building permit. Still it’s nice to dream . . . .
Another wonderful day in the life of RV Sue! You’ve met some very interesting people. And that little cordwood cabin is a gem. “Another wonderful day in the life of RVSue!” That gave me a chuckle. I sure do have the life and such good people come my way… I have to shake my head in wonder at times. Yes, that little cabin will call my name for a very long time! What great people! That cabin is beautiful. I sure hope they figure out what is happening to the chickens. You remember the chickens! We’ve been talking about our veterans and the cabin and forgot about the poor chickens. I’ll let you know in a future post. looks like a great place to be camping. Sue when you have them grease your axles make sure they know how to properly put the seals on, you dont want them too tight. you should have them greased about every 2 years no matter the miles you have driven and then is a good time to check the brakes also. I liked seeing the cordwood cabin. my wife and I wanted to build a home that way in colorado back in the early 80s but we could not get approval. got the idea out of a Mother Earth News magazine. really enjoy your blog. we travel south in the winter and stay with the boondocker group at several locations. saw y0ur rig parked off sidewinder road this winter but didnt want to bother you. I enjoy your writings about the dogs, they are a kick. I believe I saw you as well at Sidewinder Road. Les said he talked “with that guy over there and he reads your blog.” I was going to stop by to say hello and then realized maybe you feel the same way I do about drop-in visitors! 🙂 Thanks for being considerate. Every two years? I’m hearing everything from two to five years. . . I don’t know what to do. If I had better cell phone signal, I’d make some phone calls and ask questions of a variety of people who do this kind of work. Thanks for the input and concern, Doug. Yeah, getting “approval” of a little cordwood cabin can be difficult. Here you have to have 20 acres in order to build a dwelling this small. I’m glad you enjoy my blog! Presuming you are like me, you want to keep your rig totally up to snuff, but on the other hand, you know that whenever an “unknown” person gets their mitts on it, there is the potential to make things worse (not that there are not wonderful mechanics out there, but not all are). I’m used to boat trailer bearings, and they really take a pounding due to being submerged when launching (oftentimes when hot). Salt water just makes it worse. Even those will usually go a year or two though. Anyway, what I really wanted to say was that basically, you don’t want the bearings running hot. Heat = damage = problems. If there is no excess heat, then that typically means that things are fine. I would think it should be possible to go more than two years. I also think that if there isn’t any excessive heat, then things are most likely fine (in other words, I can’t imagine any problem that would not generate heat, but I am not a professional, so I am open to other views). BAFX Products (TM) – Non Contact – Infrared (IR) Thermometer (-58F – +1,022F) – W/ Pointer Sight – BATTERY INCLUDED! The other product I highly recommend for long-distance traveling costs a bit more, so maybe not as much of a no-brainer, but that is a Scan Gauge II. It’s a thing that you plug into the OBD II port on your vehicle, and it can then display any four of a large number of data points. I monitor engine temperature, transmission temperature, alternator output, and gas mileage (or sometimes RPM or etc…. it varies, but always the first two). They really are plug and play. Anyway, just figured I’d mention that temperature would give you a good idea of how your bearings are doing, and whether or not they need servicing. On my trailer I like to see something around 105º, which runs a bit hotter in really hot ambient temperatures. On the other hand, when I first started out, after a “pro” had done my bearings, I felt they were too hot. Contacted the shop and they assumed my hands were just tender and I didn’t know what “too hot” felt like. I had no number to give them. I stopped and bought an IR thermometer and then was able to see they were over 200º! Definitely not right (which was confirmed when I stopped at the next town and we opened things up to look at them – not a pro job for sure, and we re-did them all which was when I started seeing the temps that I now consider normal, MUCH less than they were. Oh, and as long as I am rattling on: The bearings that were the default for my trailer were made in China. I know that high quality parts can be made there, but my problem was I had no way of knowing, and certainly a lot of parts we get from there are not optimum. So I took the bearings to a bearing house, where they were able to look at them and know what size, etc. they were, and I bought genuine Timken bearings, made in the U.S.A. They were a little more expensive, but I like knowing they are there. I carry the other ones as spares now. The reason your original comment (above) did not appear is because it had two links. I didn’t block it. I have my spam filter set to catch any comments with two or more links, because that’s what a lot of spam has. Once I saw your comment in my pending folder, I took out the links and replaced them with my Amazon links and then went ahead and approved the comment. I deleted your second comment because there’s no need to apologize and it held duplicate content to your first comment. If I’d known about that thermometer a few days ago, I would’ve added it to my Amazon order! I am nervous that I’ll encounter somebody new on the job or careless or whatever and have a problem like you had. Thanks for straightening things out – I figured it was the way I added the links, and I’m glad you took the time to iron it out for me. I think you’ll end up finding many uses for the IR thermometer (ranging from the practical to the silly); I know I do. To take the temperature of your hubs (you may know this, if so, never mind! ), just aim the thermometer at the metal “cylinder” in the center of the wheel. (A red dot will project from the thermometer showing where it is aiming.) I check them whenever I stop, which is good for developing a baseline. But right off the top of my head I can say that 100º is lovely and cool, and 200º was too hot, at least for my hubs. Yeah, it can be difficult to find someone who really knows what they are doing (and hard to know if they do or don’t until you have some experience with a given procedure). I had a part time job at a gas station when I was in high school, so I vaguely remember re-packing wheel bearings. I was still the victim of sloppy workmanship on my trailer though – so irritating! Half the time I end up doing things myself not because I really want to, but because it’s hard to find anyone who cares about my stuff as much as I do. But when I do… Gold! I am more than happy to pay for good work. I will “second” what Pen has said. The OBD scanner and IR thermometer will pay for themselves many times over if you use them. They also allow you to communicate with Mechanics in a positive manner. Beware with the IR gun, you will get false readings from reflective surfaces, shinny metal or chrome. Use a black “Sharpie” to blacken a small area on shiny things for a true reading. I’m sold on the thermometer. I wish the OBD scanner could tell me about oil pressure. I’m still running with a metronome for an oil pressure gauge. I appreciate you seconding Pen’s advice, Mick, and thanks for the Sharpie tip. Apparently the OBD scanner will only tell if your oil pressure is out of range and you should get a “check engine” light if that happens . For two years now the “check engine” light says howdy whenever it feels lonely. As long as it is just “howdy” and “bye” your probably OK. It still would be a good idea to have a mechanical oil pressure gauge installed. you can probably look that up online. we do our 5th wheel every 2 years, but that is a lot more weight than your rig. it depends on the miles you drive, we usually end up doing 10 to 12,000 mi a year on the trailer. it is not super critical and since you have been doing this for 3 years I would say you are pretty safe doing it that often. have fun and safe travels. 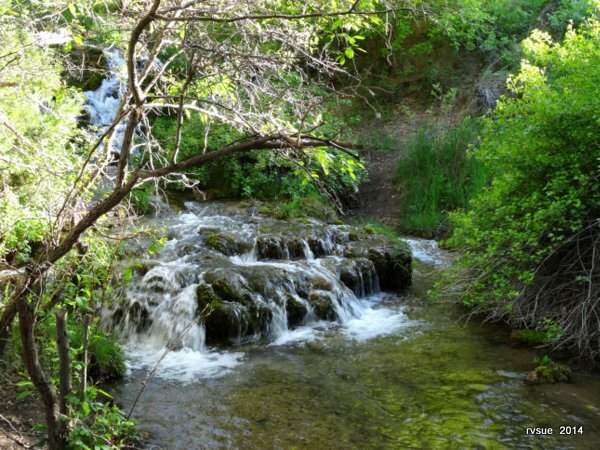 The meanderings of Ivie Creek are like out of a storybook – the ponds, waterfalls, the bubbling sounds it makes. 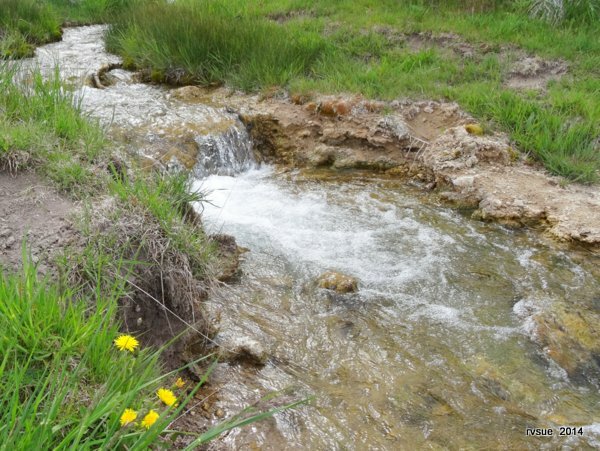 It’s what we picture a babbling brook should look like. The whole area is beautiful and with interesting history. And yes, get those bearings checked, glad they gave you a place to go to. It was wonderful hearing from you the other day! I pray you have the strength to take care of all that you have “on your plate” now. I, too, feel like I’ve spent more time with you than those few hours we had together when we explored Chloride with Chuck and Geri. Little did we know then where we all would be now! Best wishes to you and your family. . . .
What a nice family to share their little cabin and some family history with you. Thanks for sharing it with the rest of us. You’re welcome, Glenda. My pleasure! Nice to hear from you again . . . Keep cool! Interesting background details those congenial guys shared with you.Something I find that tells a bit about folks is whether they choose to emphasize their family’s placement in history or occupations in explaining where and who they’re from. Triangle bell? I don’t see it and I was there! Where is it? You are very observant in many ways. The settlement of Utah by Mormon people is quite a story of courage, hard work, and perserverance against incredible obstacles. They suffered many hardships and losses. I can understand — as I’m sure you can, too — Del’s pride in his ancestors being some of the early ones here. In your first and third photos of the cabin it’s visible on the left side of the porch dangling from the edge of the overhang.I noticed it because they matter to me,why is a story that doesn’t matter to note it’s appearance in the post. Del’s story,I’m sure,contributes much to your appreciation of each other. NOW I see it! Thank you, weather. I looked and looked for it . . . Now that I see it, I don’t know why it was hard for me to find. We see what is important to us or what triggers a memory. Those triangle bells were sounded in many a tv show of our youth. . . The woman ringing the bell and the hungry family and hired help running toward the sound to gather around a huge table of home-cooked, made from scratch, stick-to-your-ribs country food . .. If a suddenly approaching storm’s visible from a high cliff on a lake,one out fishing might need a warning ,as their limited view at water level won’t reveal the need to get ashore early enough.The sound of my bells travel a long way. Anyway,aren’t they just the quaintest things? Thank you for sharing the pictures of that adorable cabin! I know it is a man cave, but you have to admit, is it cute! Love the details of the construction…cool. Altering the plan just a bit, to add a bath and washer/dryer hook ups, and adding solar would make a perfect, permanent home base. Have a great day, Sue! This inquiring mind wants to hear more about the Ivie! My sister Pauline explained the part you didn’t understand… Her comment is below. Have a great day, too . . .
Oh yes….climbing roses, fragrant, of course….a patch of zinnias for cutting (to put in a small pitcher on the table), and some salvia greggi to attract the hummingbirds. Low maintenance + high beauty value. Also, pup Gracie and I would move our swing to the front porch. Thank you to Pauline for her explanation of the Ivies. Thanks for the story Sue. We will spend Memorial Day inside. The lakes are full, festivals everywhere and when I was younger I might have visited them. Now though, peace and quiet are the order of the day. Hope your day is peaceful too. I agree…. I’m for peace and peacefulness on this day. I saw carnival rides being set up yesterday. Ugh. I know kids love them, but the noise! It’s nice not to be a part of that. Best wishes for a relaxing, peaceful day, brought to you, in part, by our veterans. WOW!! This post and the last one are fantastic. Now, that is my idea of a beautiful campsite. The green trees, the shade, the babbling brook! Absolutely beautiful pictures. I too, was fascinated by the cordwood cabin and the father and son who built it. Thank you to Del, for helping in the placing of flags. Thanks to all the military men and women who have served this country. Will always remember those who went into the service and never came back…giving the ultimate sacrifice. Remembering their families also. I also pray for the Department of Veterans Affairs…. Lord, our service men and women deserve so much more. THANK YOU, Pauline, for explaining what Del meant when he said, “My great-great-grandfather was killed by an Ivie.” You got it perfectly. You also wrote an excellent tribute to those who gave all. I appreciate that. And thank you for the compliment on the latest two posts. It’s always easier when I have rich material to work into a blog entry. And it isn’t hard to take beautiful photos in this place! Another sterling episode in the one and only blog I read. Sue, you are so outgoing when you initiate the contact. Del and son were a good find. Two real gentlemen. The cabin is great, it’s too bad when you first went there you didn’t have your camera. I would have liked to see the interior too. I noticed the box fan in the window so they must have a generator (ugh) stashed somewhere. Bless all the living survivors of the men and women who gave up their lives in service to America. I wish all my fellow vets a thoughtful and mellow Memorial Day. Fly your flags folks!! I’m delighted you liked this “episode.” I’m honored you choose my blog to be the only one you read. Maybe it’s better that I didn’t have my camera. It would be kind of intrusive to publish pics of the interior of someone’s home, even a tiny cabin. I have to be careful about that. I did ask Del if it’s okay for me to write about meeting him and posting photos of the cabin and he’s fine with that. If they’ve used a generator since I’ve been here, it must be a good one because I haven’t heard a thing. I join you in the blessing and wish expressed in your last paragraph. I’ve been reading your blog for a few months and have enjoyed your travels along with admiring your lifestyle. I’m about 8 months from retirement and spouse and I are looking to travel in our 23′ Mackenzie Ion (we had a 18′ Cirkira–similar to a FunFinder–for an extended period of time but determined it was a little small for two for long-term traveling) and can’t wait. My spouse has had a lot of experience maintaining and repairing trailers and said to tell you that the inner bearings of the axle can’t be inspectedwithout removing the seals (which need to be replaced anyway); make sure whoever does the job is aware and is competent in trailer repair. It’s also a good time to inspect the tires for cracks, etc. Even Les Schwab has neglected to do the “inner” seals. Be glad to answer any other questions regarding the process. Have fun and look forward to future posts. It’s good that you have experience traveling in an 18-footer together. Now you know better what will suit you both when you retire. Only eight months to go! That’s wonderful! I’m confused about this wheel service. I’m getting many different pieces of advice about what needs to be done, ranging from a simple squirting of grease through the hub (not needing more extensive work at this time) to going whole hog with inspection, repacking the bearings, replacing the seals, etc. I’ll be writing more on this. Thanks for caring enough to address this situation with me. 1) The squirt works if you have an “easy-lube axle.” It will have Zerk fitting and you’ll need a grease gun. Happened to us and was very unpleasant and expensive. Also caused us to purchase roadside assistance policy. Thanks, Robin and Ken, for very clear recommendations re what I should do about the BLT’s wheels. It is the easy-lube axle. I appreciate you taking the time and effort to explain it to me. I’ll write about this in a future post. Ken will be happy he has helped. 🙂 Yes, do keep us posted. Have a great day, Sue. Thanks for letting us ride along. Your family roots are in this area? I’m especially glad I’m here to write about it for you! I’m also pleased my blog has heightened your appreciation of the beauty that is here, both in nature and in the people. Wishing you a great day, too! HI Sue, I think you have found the best place ever. Have you seen a ranger of any type. I think I would stay there until one forced me to leave. Creek walking is one of my favorite things to do. I could spend a year there shooting pictures during all conditions. I would love to see it in ice and snow and then watch it a full flow. I’d like to email you a couple B&W images from the Paria area but not without your permission. A little incentive so to speak. No, I haven’t seen a ranger. I did meet the rangers for this district last year at their office in Ephraim when we camped on Badger Mountain. Nice people. Professional and accommodating. It is very tempting to stay here for several weeks. The creek and surroundings are a daily pleasure. Here’s my feeling about staying . . . There are only six good spots here (outside the campground). At this point it doesn’t look like our presence has kept anyone from camping along the creek for free. However, since the rangers could prohibit camping here because it’s close to a fee campground, I don’t want to over-stay my welcome. I hope other campers don’t either. I’m not preaching at you. You were simply emphasizing how much you would enjoy camping here year round. The above was written for all my readers. Several have expressed an interest in camping here. It’s important that we remember to share. I believe you already have my email address? If you’d like to send the pics, go ahead, although I don’t know if I’ll be able to open them up soon, what with this slow connection. Super post. I really enjoy it when you meet the locals. Such a cute cabin I would have loved to see inside. I have a how to book here for stack wall building. Lots of interesting designs as we once thought we might try one, also researched straw bale building. Such a lovely camp you are in. Thanks for the “super post” compliment. Oops. Never mind. Beautiful waterfall photos! Thanks, Deadeye. And yes, you are first. All my readers are first in my book. I’d want to stay a long time at most of the places you’ve been so I’m sure there are more perfect places to find down the road. What stands out for me the most is the contrast between the carnival in “town” and the tranquility of your creek side location. It is a true expression of the freedom we enjoy in this country – to have those options. I may not be at a parade this morning, nor have a flag flying on my porch, but I am grateful everyday for the ultimate sacrifice made by so many who have ensured us all the freedom to make choices. Very well written, Jodee, and an excellent point about choices. Over the span of our lives our preferences change and we have the freedom to seek what we enjoy, thanks to those we remember and honor today. REMINDER TO MY FELLOW KEENS SHOES FANS: This is the last day of the Memorial Day sale (You can click on the temporary ad at the very bottom). Thank you to those of you who already ordered shoes through my blog. I saw them on my Amazon orders report this morning and it made a great start for my day. May you wear them in good health and happiness wherever you go! Reading your post every day. These pictures are so beautiful. I am amazed at how nice the cabin is. I wouldn’t mind on of those myself on a river or stream. I picked up my Runaway. Anyone wants to see it you can check out my freespirit.wordpress. I am staying home during the holiday. I don’t like lots of traffic and people who are drinking and driving. I am fixing up the inside of my camper. These come empty except for the air conditioner and a shelf. Bought a 6 ft cot bed with a miracle foam cushion. It is so comfortable. I will be a happy camper. The toilet is larger than I though but I love it! Holds 5 gallons. Flushes with a handle and you pump water from the top from a button. It runs on 2 AA batteries. I put up the curtains. I bought new red sheets and my friend Sandy wipped out her sewing machine and made me curtains and pillow cases. I bought a Navy blue comforter at Goodwill for $30.00. I slept in it the last two nights to get accustomed to it. Plugged into my sons house for air conditioning. Still lots of things to purchase, but I am 3/4 of the way done. Hope to start my Maiden Voyage second week of June. You know how long I have waited and my new life is about to begin! I am heading from Florida to Maine on my first trip. When I return to Florida I would like to head West, Texas, Arizona and maybe even Calif. Who knows.. no time limit, just enjoy each day. Hope too meet you in person someday. Sharon from Fl. Wow! You’ve been a busy lady! Congratulations on the Runaway and all that you’ve accomplished so far in making her perfect for you and your plans. The second week of June is right around the corner! I’m very happy that you will be on the road at last. That’s an ambitious trip, Florida to Maine. You’re a can-do gal and I expect you’ll have a great trip. Your excitement jumps off my monitor. The wait will soon be over. You’re on your way! The best of luck to you, Sharon. May God bless you along every mile. I love the small one room cabin…it’s my cup of tea of living space also. I was raised in a one room hogan so I’m inclined towards small living spaces. However, that doesn’t stop me from admiring large living quarters too i.e. big old historic homes, castles, etc. My sisters and I have 180 acres of land. Two sisters live on it now close to one another but I choose a site much further away in a very spacious secluded area. I have yet to build a house on it yet but I’m thinking it’s got to be built to last generations, fireproof, and withstand the elements. My daughter and I have been collecting and searching the many ways a small house can be built without putting a lot of money into it. But we always come back to a hogan shape home…where air will flow around instead of into hidden pockets i.e. corners…the wall will be round with a dome roof. Hopefully, soon we will begin laying foundation but first all the required tests have to be made before we begin. Love learning about Ivy and Grove creek history LOL. My illiterate grandmother was baptized many times over by the Mormon faith, the Catholic faith, and others i.e. Baptist. It’s my guess that you would be happiest in a hogan shaped home. Besides the benefit of the air flow, a hogan speaks to your heart. That’s an exciting project, Rita. It’s nice that you and your daughter are working together on it. Best wishes to you both . . .
You know the style of home you are talking about is the safest in a tornado of all types of construction. If you go to google, you will find all kinds of interesting articles on their construction. Just look up “concrete dome homes”. What a great way to spend some time with locals. I wish I could buy this cabin and live there full time. Sue, since this is Memorial Day if you talk with Rusty thank him from all of us. We will always remember what he and others like him did (and continue to do so) for this country, for each of us. It’s nice of you to thank Rusty and to acknowledge the service and sacrifices of our veterans. Rusty reads comments so he may already have seen your comment. I went up to the campground today. Lots of campers up there on Memorial Day. These are the campsites closest to the restroom: #1 . . . #15 and #17 are both pull-throughs and nice. . . . and #19 which is probably the handiest to the restroom (across the road). It has a mix of sun and shade and a view of the valley. All the campsites have a picnic table and fire ring. Thank you so much. Hopefully when I get there in 2-3 weeks at least one site you mentioned is going to be available. You should have a good chance of obtaining one of these sites on a non-holiday. The more “we” tour this picturesque valley, the more excited and enthralled I become with it. 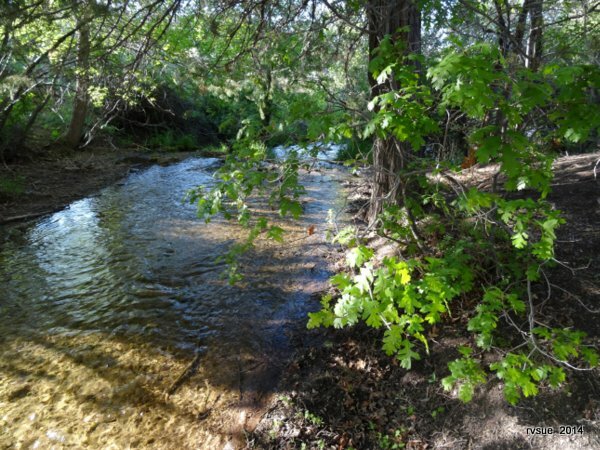 Your posts of camping along Ivie Creek have just been stellar! Not only do you blog about your everyday life of roamin’ the roads, but, now they include lessons of the area’s history, architectural design and construction! Strong work, lady! I’m really lovin’ this stop in your journey. …and yes, my flag is flying today. Remembering our military and their service for our country. Thank you to them and their families. I love to see our flag flying at a home, no matter what day of the year. A friend of mine was a caretaker for an old log cabin (over 100 years old) for several years. It is at the end of a long, private and gated road and sits down in a little cove. 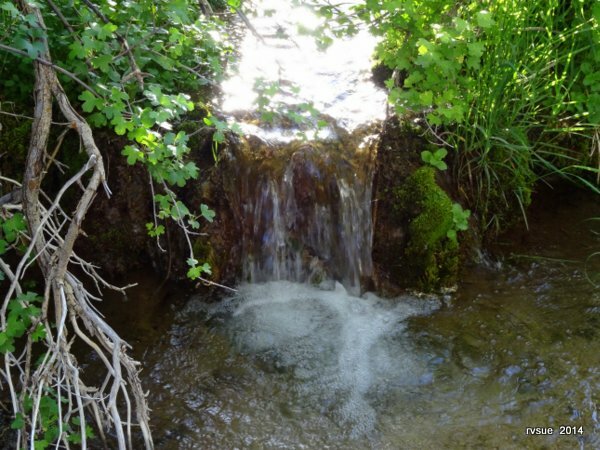 In the spring time, the ground it completely covered with wild flowers and there is a creek running in the front – from which is the water source for the cabin. It has a wood burning stove with a huge metal chimney, which is the only heat source. I fell in love with this cabin and surroundings. Such a beautiful, peaceful place to me. However, most people would snub their nose at it because it is so primitive. This Utah cabin reminds me of the one I grew to love. Well, you know I wouldn’t snub my nose at that cabin. It sounds perfect to me! Another great post…..I have been wanting a one room cabin with a wrap around porch and very large windows out in the forest since forever. Well maybe someday that will happen. 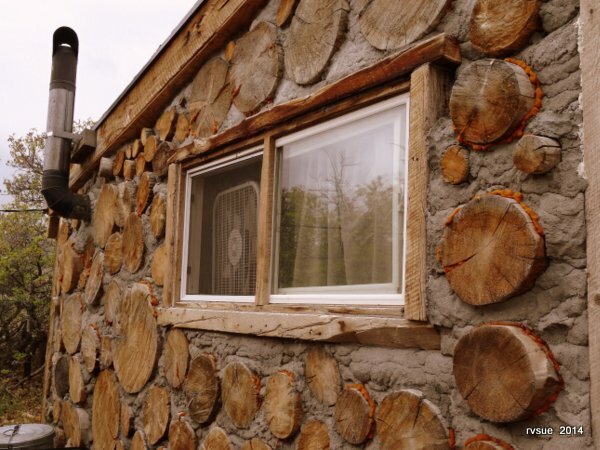 As everyone else here…..I have never heard about cordwood construction, but know that I really like it. What a fabulous cabin! Mine would definitely have a riverstone fireplace….lol…..ahhhh….where our dreams can take us! You do meet the most interesting people…don’t you? I am so happy that I have been following your blog as it makes me feel good. I love your pictures. Someday mom and I want to go to your little creek. We’ll call it Sue’s Creek. I took me about 30 minutes looking at my Benchmark atlas to find Ivie Creek. But it is marked now for future finding. That’s cute, Evelyn. I can picture you searching your Benchmark atlas and finally finding Ivie… oops, I mean… Sue’s Creek. That creek is collecting names! I’m glad you love the pictures because I have plenty of creek and waterfall photos. Be sure that you and mom bring your camp chairs to set in the creek! Get those axles greased.This year I blew the bearings out in the middle of nowhere in New Mexico.It was bound to happen eventually.I have 70K miles on the trailer and have them packed every 10K or so but time and heat will eventually get them. See, this is the kind of thing that gets to me. “Get those axles greased”… Yes, of course. I’m hesitating between having everything pulled apart at this stage or letting a grease gun squirt into my easy-to-grease type axle suffice for now. You have a light trailer but even with the ez hubs you should have them totally repacked every 20 K.I have a heavy rig and I do it at 10K.Still lost one set of bearings last trip. When you asked Del about your trailer hubs you wrote: “The Sinclair station in town,” he states without hesitation. “Don’s Sinclair.” What you did not say you ask was did he had a trailer and had he ever had the hubs serviced by Don’s Sinclair. I believe that Del was sincere with his recommendation but myself I also would be hesitant to take his advice. If it were me, I would look for a trailer sales business that also offered service. I would then look around their lot and see if they were selling trailers with E-Z Lube Dexter axles, like what you have. If they were selling trailers so equipped I would then go to the Service desk and ask for the Service Manager. Tell him what you have, how long it has been since they were serviced and how many miles you have driven and ask him for his advice. He will most likely recommend that the hubs be inspected and repacked but during that conversation you should get a good impression of what kind of service you may get. I don’t always include every detail in my story-telling. You can see my posts are plenty long enough as is. In talking with Del, I followed up with “Do they know anything about servicing wheels and axles?” and he said he’s had his trucks done there for years. I noted that he said “trucks,” not trailers. Your plan of action is very thorough and wise. One problem: I never can pull that off. I go to take a “look around the lot” and I’m intercepted with a “Can I help you?” and maneuvering to move me into the office. Nevertheless, I get your point. I have gleaned what I think is good advice that I may be able to carry out… finding a trailer sales place that also does service. I’ll need some of my noted serendipity to find a camp near such a place, as stopping for service and then driving a long distance or vice versa is not something I will do. Since not all my readers bother to look at comments, I’ll update my “hub trauma” in the next post. Thanks for writing. I always wanted a one-room cabin in the woods but have ended up with a desert site. 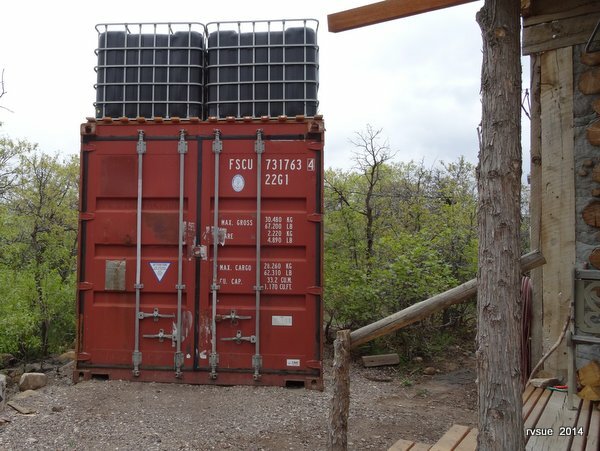 You will have to come see mine once I get everything in place; including a shipping container for a shed.